Penny sent us a puzzle as a joint birthday present today! We love it! It's actually 12 puzzles in 1. It's the Britto puzzle a month calendar. 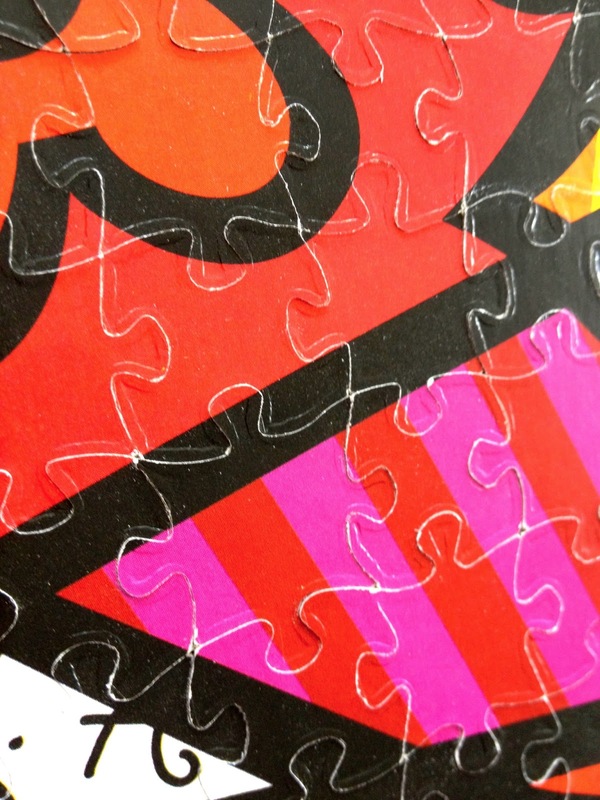 Each month you put together a new puzzle and snap it into the calendar frame. 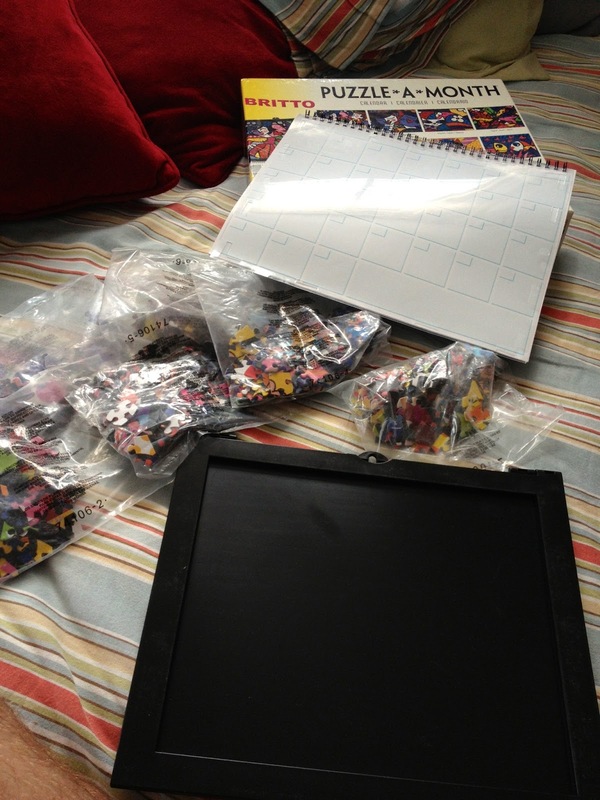 The puzzle itself is 6 double sided puzzles and it comes in 6 bags. Each puzzle is 154 pieces and it took me less than 15 minutes to get 1 together (without looking at the box). Although the puzzle is double sided, the printing process makes it possible to determine which side is which so you can just flip to whatever side you want to do. After that, it was a snap. 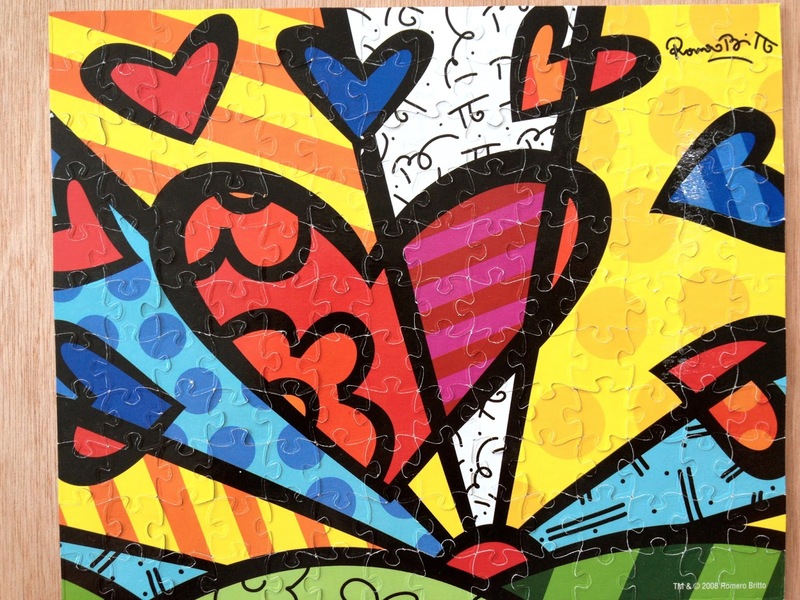 Thank you so much Penny, we just love Britto and this was on our list of puzzles to get! Really, it made our day! Whats better than getting 1 puzzle in the mail? Getting 12! The puzzles comes in 6 bags. Each is a double sided puzzle. This is one of my favorites! It's the same image on my coffee mug. The double sided printing process leave a little bit to be desired. It's very obvious what side is what so it really just becomes a matter of deciding which puzzle you want to do. The front side looks great! The pieces are all either 4 in or 4 out. I don't think I have ever done one like that before. The West Indies map puzzle was similar, but that did have some variation.